What’s better than chocolate brownies? White chocolate cheesecake brownie slice! 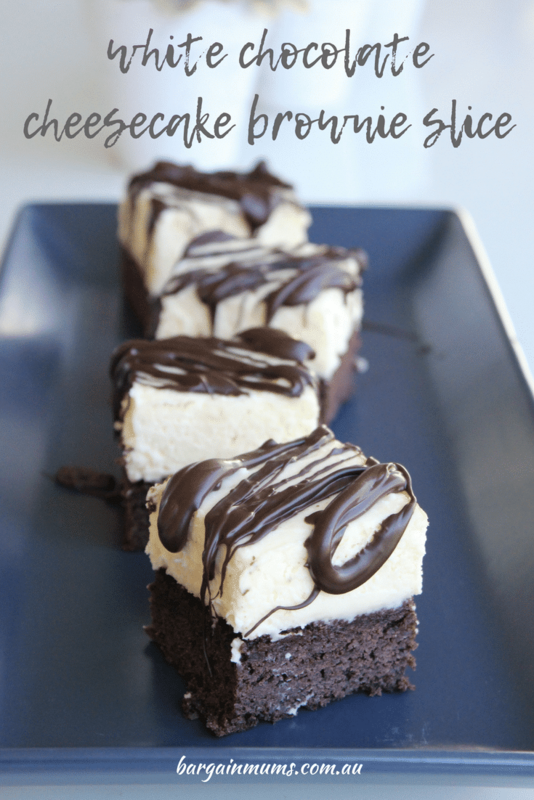 The richness of chocolate brownies teamed with the creaminess of white chocolate cheesecake is the perfect match. This white chocolate cheesecake brownie slice is great for something a little different from the usual biscuit based cheesecake. 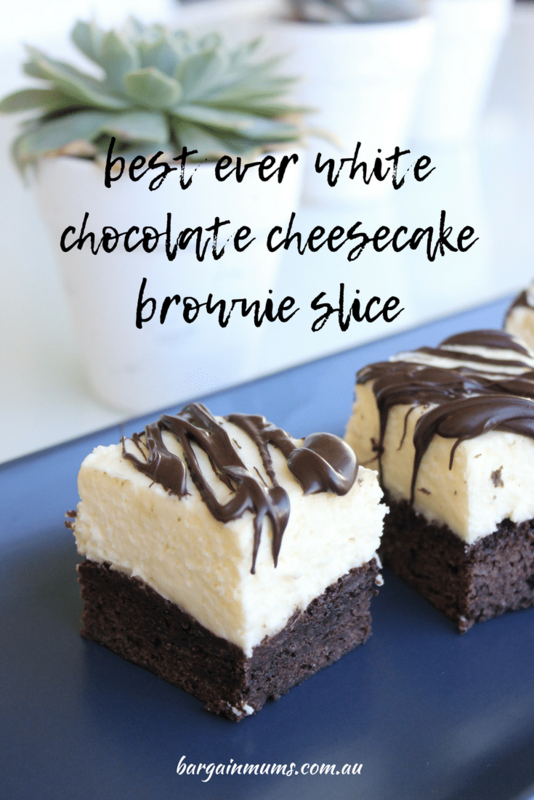 While this white chocolate cheesecake goes perfectly with the brownie base, you could easily substitute the white chocolate cheesecake layer with any other no-bake cheesecake recipe. You could also make this white chocolate cheesecake brownie slice in a round tin, and serve it in wedge shaped slices like a traditional cheesecake, but I think it works great as a slice. 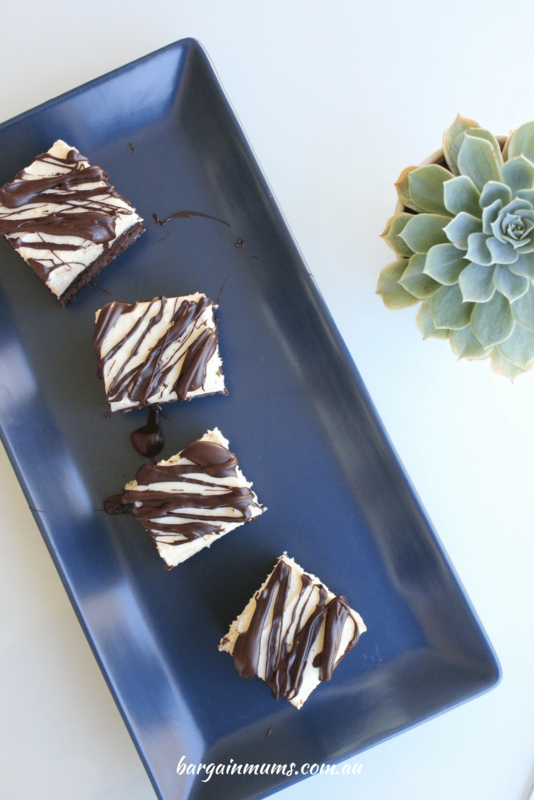 Being in slice for means it’s easy to grab a piece out of the fridge when chocolate cravings strike (or maybe that’s not such a great thing). It’s also perfect for taking along to a get together, as you can cut the pieces a little smaller to serve more people. To make the slice, first we need to begin with the brownie layer. Preheat the oven to 180c, then line a slice tin with baking paper and set aside. Add the sugar and melted butter to a large mixing bowl and stir until well combined. Add the vanilla extract and eggs and stir once again to combine. Next, add the plain flour, baking powder and cocoa powder to the mixing bowl and stir through the wet ingredients until smooth and well combined. Pour the brownie batter into the prepared slice tin, and bake in the preheated oven for around 20 minutes, or until cooked through but still fudgy in the middle. Set aside to cool completely. Once the brownie layer of the slice has cooled, it’s time to make a start on the cheesecake layer. Add to the bowl of a stand mixer the cream cheese, thickened cream, melted white chocolate, sugar and vanilla extract. Dissolve the gelatine powder in boiling water in a small bowl, and add to the stand mixer along with the other ingredients. Beat well until the mixture is smooth. Spread the cheesecake mixture over the cooled brownie base and place in the fridge to set overnight. Once set, slice and store in an airtight container in the fridge until ready to serve. Line a slice tin with baking paper and set aside. Preheat the oven to 180c. Add the melted butter and sugar to a large mixing bowl and mix until well combined. Add the vanilla extract and eggs and mix once again. Add the plain flour, baking powder and cocoa powder to the wet ingredients and mix with a spoon until smooth and well combined. Pour the brownie batter into your prepared slice tin and bake for 20 minutes, or until cooked through but still springy when touched. Let cool. extract to the bowl of a stand mixer. Dissolve the gelatine in the boiling water and add to the cream cheese, beating well until smooth. Slice and store in the fridge until ready to serve.